Wishing you and your families a very Happy Thanksgiving from Nicholas and I! 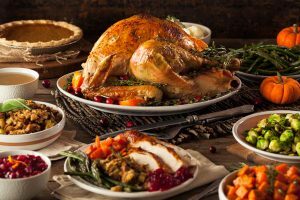 We are really looking forward to Sunday when Mama will be at her cooking best making sure all is perfect for our Thanksgiving dinner. We went with her up to Sobeys on Tuesday to pick up our Butterball. I say, “Tis a butterball, no less” (our favourite) and the vet says turkey is the very best thing we can eat, so here’s hoping and paws crossed that we get some leftovers. We’re looking forward to our family coming over, aunts, uncles, Mama’s brother and sister-in-law, all soooo much fun!!! We’re sorry that Lisa (Mama and Papa’s daughter) can’t make it home for this occasion but she’ll be here for Christmas and will stay for two whole weeks this year! We love it when Lisa comes home from Ottawa! Mama will put the turkey in the oven about midnight on Saturday and let it cook slowly all night. When we wake up Sunday morning, we’ll wake to the smell of roast turkey. I’ll be just beside myself! Then the family will come over and all will chip in with peeling vegetables, making gravy and stuffing, etc. Our dear Auntie Blue will bring homemade cranberry sauce and homemade apple crisp, her speciality!!! Yummy good, says the Budster! Mama’s been busy showing houses this week to locals as well as buyers from Montreal and Toronto. She’s had offers in on two of the properties and another offer just arrived tonight. There’s nothing she enjoys more in real estate than negotiating! She’s really enjoying her first week with Coldwell Banker as their Global Luxury Specialist. The entire team at Coldwell have made her feel soooo welcome!!! She had a problem with the signs this week as they came in with the type too small and difficult to read so new larger ones are in the process with much larger type. Will be ready in a week! Mama listed a lovely 4 bedroom/5 bath water view home in Rothesay today with some gorgeous features. It will be hitting our web sites, the MLS and social media the first of the week. Our new social media team have been doing a great job boosting our ratings, hits, likes and shares on social media. They are so creative and I appreciate all that they do. They even mentioned my little friend Melik who was up for adoption and furrever found a home! We don’t have open houses on special occasions as we don’t want to disturb our clients who appreciate special time with their families. Nicholas and I have so much to be thankful for staring with a loving family, a warm, cosy bed, healthy food, fresh water, good health and all the love a four-legged pouch can handle. So have a wonderful Thanksgiving and we’ll talk soon.